StoGuard RapidFill is a one-component air barrier and waterproof material used to seal sheathing joints, seams, gaps, and cracks up to a half-inch wide as well as transitions in above-grade wall construction. The product is compatible with most common building materials. Rapid drying time allows for same-day installation of other air barrier components. 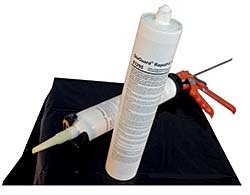 Application can occur on damp surfaces, during cold weather, and in high-humidity conditions.